The Harmar AquaJoy Premier Plus is a two-piece battery operated bath lift that can be electronically reclined or stopped at the preferred sitting position. The AquaJoy Premier Plus is easy to put together and take apart, ensuring ease of use and transportation. 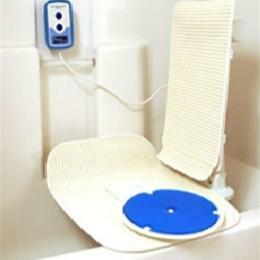 With easy release, counter balanced suction feet, the bath lift can be removed from the bath with ease. The fully waterproof floating hand control contains a light weight battery and has large operating buttons as well as an indicator light and an easy to use and simple to understand charger. The bath lift will be suitable for heavier clients. The standard, washable and easily removed covers are padded and comfortable to sit on. Optional Gel Filled Covers which provide extra padding are available for low weight or pressure care clients and offer an alternative solution with more specific needs.